Customized riding holidays in South Africa at two different upscale lodges located on their own private game reserve in the malaria-free Waterberg region of the Limpopo province. These riding vacations are tailor-made to fit your group, families with kids, single travelers, riders with non-riding companions or honeymooners. The safaris are flexible and personalized. Guests stay at Ant’s Nest or Ant’s Hill, classic safari lodges owned and run by the Babers. The Baber family were early pioneers in the Waterberg area. Guests ride well trained and cared for horses including Thoroughbreds, Arabians and Boerperd crosses. These riding safaris are for riders of all skill levels. There are even ponies for children who wish to ride. Horse riding is a great way to view game, as it's an unobtrusive way to get into nature and reach places that you can only get on two feet or four. Many places you ride are not vehicle accessible. Non-riders may even want to saddle up at some point on the safari vacation, as it's one of the best ways to view wildlife! For those who don't wish to ride, enjoy guided bush walks, game drives, elephant-back safaris and cycling safaris. Relax with a massage or watch the sun go down by the pool. On these riding safaris, you may view rhino, red hartebeest, kudu, impala, zebra, blesbuck, warthog, bushpig, buffalo, nyala, waterbuck, giraffe, eland, sable, oryx, wildebeest, and brown hyena as well as all the smaller animals such as African wild cat, mongoose and more than 250 species of birds. There are no elephants or lions. You may also ride to see bushman paintings and archaeological sites. Sip South African wines and feast on sumptuous home cooking. Meals are often served outside-- under the stars, on the trails and beyond. Choose to stay in Ant's Nest, an old colonial homestead that's been lovingly restored and is surrounded by gardens or Ant's Hill, built on a ridge overlooking a gorge offering stunning views of plains and distant hills. Specialising in a home from home experience, both lodges can either be booked exclusively, to one group at a time, or you can book just one room, making it a wonderful destination for families, riders, honeymooners or just good friends travelling together. Contact us to help discover the best fit for you and to plan your dream South Africa safari vacation. Summer (November to March) – the days can get quite warm (up to 83 to 90 degrees F or 28-32 degrees C on average) but it is a dry heat. There is summer rainfall, normally in the form of thunder storms. These rarely affect activities and are usually in the evening, however, the African climate is still always unpredictable. Autumn (April to May) – days can still be warm but the evenings cool down. Average day time temperature 72-84 degrees F (22-28 degrees C). Evenings 50 to 59 degrees F (10-15 degrees C). Winter (June to August) – days are warm (temperatures in the mid-twenties) evenings and early mornings very cold with average early morning temperatures 41 - 54 degrees F (5-12 degrees C). It very rarely rains at this time when the bush is golden and dry. Spring (September, October) – days start getting hotter, evenings and mornings could still be crisp but not as cold. A very slim chance of rain. On occasion we can get very hot days. - Riding helmets are compulsory for all guests and the lodge has a number of helmets in different sizes for guests to borrow. They do, however, recommend that you bring your own well-fitted helmet if you plan to spend many an hour in the saddle. Wide brim hat covers are advisable. Warm fleece/jacket throughout the year, especially during South Africa's winter months. Camera with plenty of spare film and batteries or memory card and charger. Light rain jacket (if travelling in the rainy season). Please let Equitrekking Travel's preferred travel agents know your packing questions prior to the trip. Check out general informaiton on packing for riding vacations and see what we took on our Africa riding holidays. Electricity: There are large round-pin plugs with AC 220V voltage at all lodges. Plugs vary from country to country, so do travel with a set of adapters to ensure your ability to charge and use your appliances on safari. There are over 80 responsive horses, inlcuding Thoroughbreds, Arabians and Boerperd crosses, that can cater to all riding abilities. There are also some fabulous children’s ponies. You'll experience some of the greatest game viewing in the African bush – from horseback. You can canter along open sandy tracks or traverse high ridges with spectacular vistas. The pace can be as fast or relaxed as the riders would like. Often we can get so close to the game that the experience remains unforgettable. Each ride is led by two competent guides and the emphasis is on safety at all times. The enthusiastic rider may wish to ride twice daily and turn their stay into a luxury riding safari. Families or couples, where some ride and others don’t, can enjoy separate activities. As we always have two guides on each ride novices can go out with their more competent partners without slowing the ride. Basic lessons for non-riders are available at both bush homes; many guests learn to ride and gain confidence here. While on this South Africa horse safari, you'll use comfortable McClellan saddles made locally for long hours in the saddle. These are based on the famous US cavalry saddle designed for the comfort of both horse and rider alike. There are also a few English saddles available. 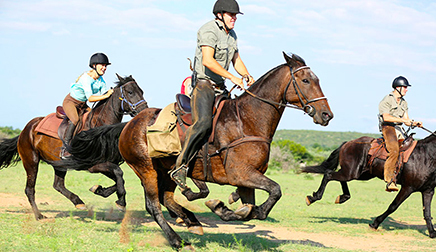 In addition to horse riding and game viewing, there are a variety of additional activities on and off the property. For those who prefer walking, our guides will lead you through the bushveld on foot. These walks are informative and interactive, enabling you to gain knowledge of African flora and fauna. One can often miss the smaller details of our beautiful environment when on a vehicle or horseback, so guided walks are highly recommended. Whilst these can be in the form of a gentle stroll, the more energetic can hike over the plains and up impressive gorges. Whilst identifying insects and birds and learning about the medicinal uses of various plants you can also learn how to track game. Specialized bug hunts are available for children at both bush homes. Our guides will be available to take you out in an open 4x4 Land Cruiser either for morning or afternoon game drives or using a spotlight at night to find elusive nocturnal animals, such as the rare brown hyena, aardvark bushbaby and porcupine. The advantage of a game drive is that you are able to cover more ground across the reserve. Game drives and walks can often be combined to make game viewing and photography more exciting. You may find: white rhino, zebra, giraffe, warthog, blue wildebeest, sable antelope, nyala, waterbuck, impala, red hartebeest, blesbok, kudu, buffalo, Livingstone eland, oryx, mountain reedbuck, bushbuck and nyala, steenbok, mongoose, springhare, chacma baboon, vervet monkeys, duiker, black backed jackal, scrub hare, lesser bush baby, tree squirrel, rock hyraxes. You may sometimes spot nocturnal species such as: leopard, caracal, aardvark, brown hyena, porcupine, bush pig, bat eared fox, stripped polecat, honey badger, serval cat, African civet, genets, wild cat and klipspringer. Both lodges have various facilities ideal for kids, such as the heated swimming pools, a trampolines, sand pits, a badminton & volley ball net with a selection of toys and books. Children are welcome to join their parents for dinner, alternatively, special meal times can be arranged. Due to our relaxed and informal atmosphere, this is an ideal riding safari for families with kids of all ages. The incredibly diverse terrain offers extreme technical cycling as well as gentle meanders. These can be either half an hour or hour massages in the privacy of your own room or next to the pool, wherever you prefer(additional charge applies). • A local ‘Big Five’ game reserve, so you can try to find the lion and elephant we would rather not ride or walk with. • Elephant Safari: you can take the opportunity of interacting with a number of trained African Elephants, which is the most enjoyable and educational experience. This is followed by a ride through the bush on elephant-back with an experienced elephant handler. • Adventurous guests can have the opportunity to enjoy a day trip to the Lapalala Wilderness reserve which is a 35 000 ha reserve. Activities on offer here include guided walks, rock art viewing and picnics by the river where you can also swim. • On Sundays we go to a historic thatched church where you can meet local people and see the 1914 building designed by Sir Herbert Baker. Children can attend a colourful Sunday school where the Sotho children sing choruses in rousing harmony. • Shopping in the local town where you will find a wide variety of African arts and crafts. Ant’s Nest is where it all began. Lying in a natural amphitheatre the original homestead, with its wide verandahs, has a classic, relaxed, African atmosphere. A wide variety of game frequents the waterhole in front of the bush home where horses and dogs abound. Tessa, who grew up in Kenya, brought a stylish warmth to the colonial house using classic furniture fashioned from local fabrics, timber and stone. The six luxurious en-suite bedrooms accommodate a maximum of twelve guests. There is a swimming pool in the garden, ideal for those needing some exercise or for purely cooling off after an active day. This is great for kids as it’s heated all year. Extensive lawns with indigenous plants surround the pool and there is a wonderful thatched chill-out spot with vast sofa beds where you can relax during the heat of the day. Ant’s Hill is hosted by a wonderful team who create an open and friendly atmosphere. Built on the edge of a cliff, this bush home offers breathtaking views across the Waterberg. With spacious rooms and vast folding doors, the thatched lodge blends into the bush, while exotic furniture and brightly coloured African fabrics make it both sophisticated and comfortable. The draped four-poster beds are seven foot wide and each bathroom is spectacular, offering guests sunken baths and waterfall showers. Set in boulders on the edge of the cliff, the heated swimming pool cascades over the lip of the gorge, inducing you to relax there for hours. Ant’s Hill caters for a maximum of 16 guests and can be booked non-exclusively or exclusively to one party. At both lodges, enjoy lovely cuisine. Eat a bush breakfast outdoors, indulge in starlit dinners around open fires or impromptu lunches beneath a shady tree. You will often end morning game activities with a bush lunch, while at night, you may sit around open fires under the stars. The chefs can cater for all dietary requirements and we serve excellent South African estate wines. Singles, families, groups, honeymooners... these South Africa horse safaris can be customized for all levels of riders and their non-riding companions. These tailor-made South Africa riding holidays are great for all riding abilities and ages. Ant’s Nest or Ant’s Hill riding holidays in South Africa are totally customizeable. Enjoy horse riding, game drives and bush walks to view a variety of wildlife. Both lodges are open all year and the arrival, departure and legnth of your trips is set to match your desires. A seven night stay is recommended to relax and fully enjoy the personalized service at Ants Loges. Each lodge can be booked at an adult and child rate on a non exclusive basis or alternatively booked exclusively for a private group. Please note that Ant's Nest must be booked on an exclusive basis at certain times when a minimum rate applies. The prices below are for five nights. Shorter or longer stays are possible so please ask us for a quote. * Prices shown are subject to daily exchange rate fluctuations. Prices are indicative only; the price of your chosen holiday will be reconfirmed by your travel consultant, prior to your making a booking. A single supplement applies at certain periods. Guests do not need to be able to ride to go out on these riding safaris. The herd of over 80 horses is suitable for all levels of riders. Rides operate to a maximum of 6 riders and 2 guides to ensure guests' safety and for a more controlled ride. Riders of different abilities will not be put on the same ride unless they are part of the same family and wish to do so. Riding hats are compulsory for all riders. A typical riding day would start with a light breakfast followed by a ride which can vary in length according to the riders. Morning rides are normally 2.5 to 3 hours long after which you will return to the lodge for a lunch followed by a siesta or quick cool off in the pool. Your afternoon ride will follow after high noon tea. These later rides are approximately 1.5 to 2 hours long. We have various family units available for families however all deluxe rooms are also large enough for children to share with their parents. When couples are travelling on their own they will not be forced to have sundowners or dinners with guests travelling with children younger than 12 year of age. Just as memorable was an evening ride while the sun tainted the sky as red as the soil. The lodge itself was beautiful and the service was out of this world. Riding for all abilities, game drives, bush walks- and lashings of TLC from Anthony and Tessa Baber and their dedicated crew. We could not have dreamed of a better place or nicer people – we will all talk about and remember this trip forever. It could not be beaten. Thanx for this most wonderful experience all of us will never forget this. We have both fallen in love with Africa. Ant’s Nest is a small haven of tranquility and beauty. What a fantastic way to finish our tour of South Africa, we kept the best ‘til last! A truly magical place, the staff were fantastic, the food incredible and the riding a brilliant experience and one the children and we will never forget. I look forward to coming back and renewing my horse riding! Thanks for a wonderful few days… we will be back! Thanks for a magical holiday, perfect hosts, perfect horses, only drawback was going home! Exceeded all expectations! We’ll be back! Love the place, people and the fabulous horses. Thank you so much. The holiday of a lifetime – fantastic hospitality – wonderful staff and horses. I couldn’t have wanted for anything more. I don’t want to leave you all! up to 4 to 5 hours per day, depending on your wishes. 3 hours north of Johannesburg International Airport. 3.5 hours east of Madikwe and 5 hours west of the Kruger National Park. Private road transfers or air charters between destinations can be arrange or you may wish to rent your own car.